Having a Walmart almost within walking distance is really not the best idea for your budget . I admit that I love to do a little Walmart shopping every now and then. Since the Walmart near us has groceries too, it's a good excuse to stop and take a little look see, PLUS avoid the grocery store. If you ask the husband, he will invariably tell you that I call him weekly on my way home from work to say, "I'm just going to stop real quick at the Walmart and pick up a few things." I have a real problem with just "wandering around" the store JUST TO LOOK. I waste more time "wandering" because I get in that store and think "maybe they got a new shipment of"... sandals or flowers or whatever happens to pop into my brain. I was looking for a receipt to take something back the other day and my husband happened to notice all the many receipts I was searching through. (Here's a news bulletin: I'm a bit compulsive and have kept all my receipts for the last couple of years.) 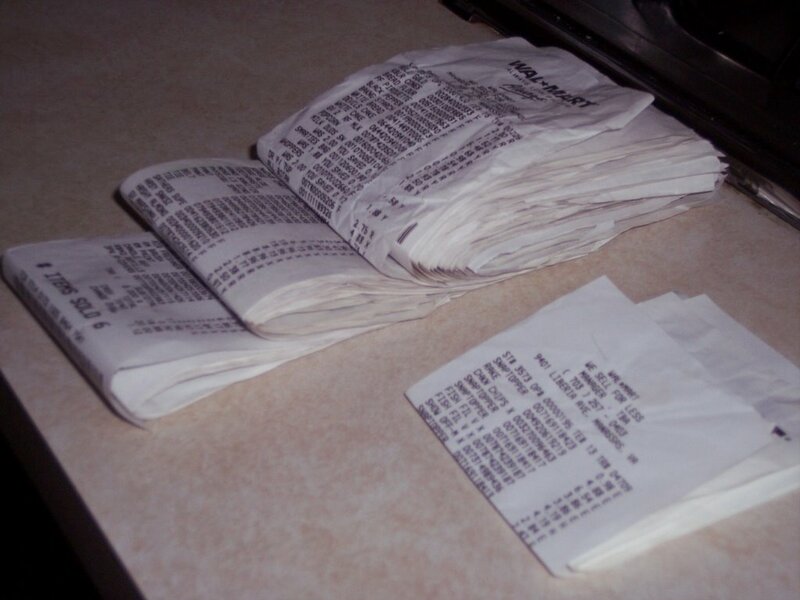 He was giving me a hard time about that and asked why I needed to keep several years of receipts. While I had them all lined out on the counter, it became obvious that when the Walmart was located on the other side of town, I didn't frequent Walmart much. Now I know there are some out there that do not and will not support Walmart because of some of their policies. We have one friend that Hates Walmart and will expound on why we should not support it. I agree that they could improve on some things. I know from my experience of filling out disability paperwork and return to work notes for some of my patients over the years that Walmart does not make it easy for their employees sometimes. One time I had to write a note saying that one of my pregnant patient's needed to take a bathroom break every so many minutes/hours and the same for getting drinks of water!!?? That is ridiculous that a person needs a note to get a drink! It doesn't stop me from enjoying wandering around and "finding a deal". I had a few errands to run the other day, and Walmart was on the list. When I came home, I was talking to my husband and I said that I hadn't stopped at Walmart. He very calmy said, "I know." I said, "How did you know I didn't stop there...I just got home." He said, "You weren't gone very long!" Unfortunately, Walmart = Money Spent and I would definiately have more money if the Walmart was still located across town! You know how much I love Walmart....and athe deals I get. I will be sad when White Stag is no longer available....wonder what I will do then? and is definately spelled correctly or is ti defiately...we really must be related! Well, if I could TYPE maybe I would make sense but I REALLY want to put an "A" in definitely.....seems so wrong this way! walmart will someday be the death of all of us...well,maybe not death but it will send many of us to the poor house! living a half hour away from the closest store (of any kind), you would think that i could control myself but i can't remember the last time i left walmart without spending over $100. usually it is much higher. but when you think about the fact that if you bought all of the same things at other places, you would spend much more. and is anyone else amazed at the difference in walmarts? my local one (1/2 hour away) stocks maybe half of the stuff the walmart in superior does. needless to say, i often drive the 45 minutes to superior for the truly superior walmart. ps...target is still funner! pss...hello to all of my VA family, love ya!